As the Civil Engineer and Project Manager for Lochsa Engineering, I was responsible not only for the design, plans, and specifications for the Bonneville Transit Center but also for the civil engineering construction administration and inspections during construction. The transit center filled a long standing need for a modern central bus transit hub in downtown Las Vegas. The transit center construction was focused not only on efficient movement of busses and passengers but also on green construction with a goal of obtaining LEED Platinum certification. The owner of this project was the Regional Transportation Commission of Southern Nevada (RTC) and took a very hands on approach to both the design and construction. The hands on approach of the RTC allowed us to develop a project that was exactly what the RTC wanted. The improvements constructed included not only the entire city transit center but also roadway and utility improvements on all sides of the transit center to facilitate the increased bus and pedestrian traffic the new transit center would bring. 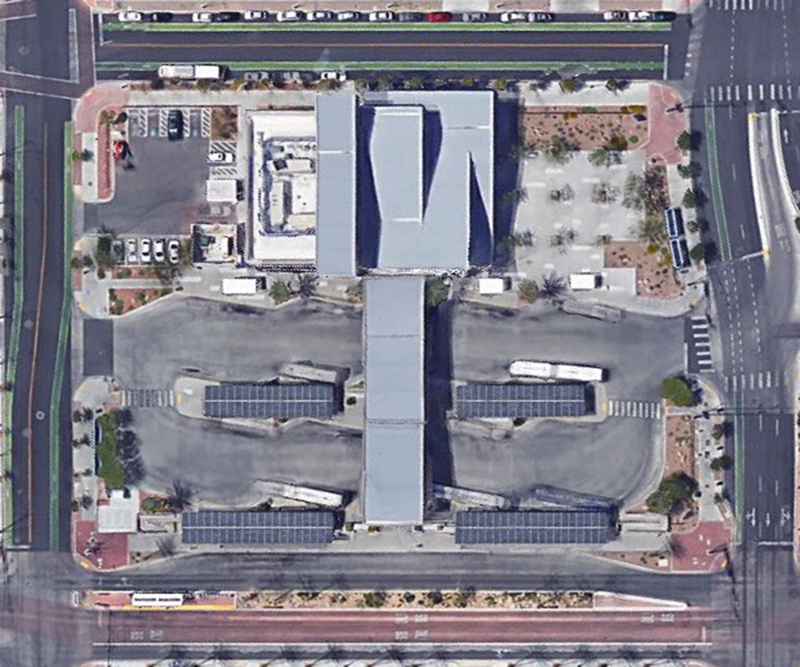 The Bonneville Transit Center became only the third building in all of Southern Nevada to achieve Platinum certification, the highest level of recognition from LEED, the nation’s preeminent program for the design, construction and operation of high performance green buildings. RTC uses the transit station as the headquarters for the transit system and as an example of the commitment to sustainable transportation and green building that the RTC has made. The Bonneville Transit Center’s numerous green features qualified it for LEED Platinum status, including onsite renewable energy generation using solar photovoltaic energy panels to offset peak electricity demands and costs. The building also uses natural day lighting for nearly 80 percent of the building’s occupied space, further reducing its energy draw. Overall, the transit center’s energy efficient design features are estimated to reduce energy consumption by 58 percent. In addition to energy efficiency, the Bonneville Transit Center has many water efficient features including landscaping that uses desert plants, drip irrigation, and low-flow plumbing fixtures that use 50 percent less water than traditional fixtures.